There has been talk for awhile now that Pixar was looking to open a studio here in town. It’s not a bad idea at all, given the high concentration of local tech and art talent. And it’s looking like those burbles are turning into action, as Pixar has apparently begun looking for some of their first hires – so far, these listings are through third-party job sites, and haven’t yet been confirmed or reflected by Pixar’s own job site, but Pixar watchers are saying it’s all for reals. The first job listings for Pixar’s future studio in Vancouver, British Columbia have appeared on the web (here and here) at two independent websites (they’re not yet posted on the careers page at Pixar.com). The positions Pixar is seeking to fill are Manager of Information Systems, Production Manager, and Layout Artist. The Production Manager will report to the general manager of the Vancouver studio and their producer in Emeryille. Each of the listings term the satellite studio Pixar Canada, a “wholly-owned subsidiary of Pixar Animation Studios”. As we’ve known since the project was announced, “the Vancouver studio will produce short-form animation focusing on legacy Pixar characters from films such as Toy Story and Cars”. A well-placed source confirms that the new campus will be up and running “sometime in 2010”. Smile, you’re on Google camera! Google Street View Canada went live today, which means that if you live in Montreal, Toronto, Ottawa, Hamilton, Halifax, Calgary, Vancouver, you can now spend countless hours looking online at all the places you can go look at first hand. This is one of the better views of the Google camera car that trundled around Vancouver this past Spring (judging by the cheery blossoms), popping 360 vistas of city streets (and a few alleys). It hasn’t been a perfect launch however, as David Loukidelis, BC’s Information and Privacy Commissioner has already launched a number of complaints regarding Google’s privacy measures not working as promised (I caught a shot at Thurlow and Robson, where a cab license plate is visible. Nearby, a city bus’ plate is clear, but the automated blurring system incorrectly blurred the turn signal light.) It doesn’t sound like he’s looking to pull the plug however, rather he’s just pushing for people’s protection. See anything cool? Anything touristy? Google maps has a link tool that will create a link for exactly the view you’re looking at – just use a link shrinker. Google map links are huge! 100.5 FM has an interesting idea for promoting their station – take a five dollar bill and then drop it. As people pick it up and spend it, it moves around the city. Now, if someone were aware that there’s a special bill out there and knew what to look far (say, they were to watch The Peak’s YouTube video on the matter) and was diligent in checking their pockets every time they got a new fiver, they might win $5000. I’m wondering, how likely is it that someone will find the bill – certainly if everyone in the city knew about the contest, someone would find it quick, but I’m betting there’s a very good chance this bill will just wander off. 1 – Banks pull notes all the time. This may only temporarily remove the bill from circulation, but it could freeze it indefinitely, or even move it to another city where The Peak isn’t heard. And the longer this bill is out there, the more likely the maximum audience will be reached and passed before it’s found. 2 – Even more likely is the bill leaves the city on a person, headed on a flight to Toronto, a car-ride to Prince George, or traded in for American South of the Border. After it looked like the end of the road for Vancouver’s better-than-the-rest-of-the-world fireworks display, The Celebration of Fire Lights Festival, The Keg has stepped in to save the day. Details aren’t known, but apparently the old sponsors have signed back on as well, making it look a lot like they were previously willing to pay some, but not all of the pricetag, and the addition of The Keg’s support made it more feasible for all sponsors. So, get out your beach blanket, and fire up the police helicopters, the fireworks will be back this August! Posted in Around Town, Festivals, Food, Local News | Comments Off on Fireworks saved by food. Ever had lunch on the City Hall lawn? And yet Mayor Gregor Robertson is in trouble for proposing to turn some of the municipal HQ’s lawn space, which is currently lined up for improvement, into a community garden. It might be just me, but isn’t turning it into a garden an improvement, and a good one at that? And also, it seems a little hair-up-the-nose to pick a procedural slapfight over a chunk of land none of us have ever really considered let alone enjoyed. Coming on the thematic heels of Herb’s recent post, in a town filled with community gardens, isn’t it a good idea to promote the idea on the most high profile lawn around? And do we really want the mayor spending even a half hour debating this in council session, all things considered? Which is to say, isn’t this a non-issue? Posted in Around Town, Enviroment, Food, Local News, News and Politics | Comments Off on Ever had lunch on the City Hall lawn? Hey, if you’re digging one big hole, why not two? Remember last year, when the power substation blew up, leaving a large chunk of the downtown core without power for days and a few parts for nearly a week? Then refresh your memory. With that in mind, you’ll be happy to note that the addition of a third transformer (presumably to help avoid future problems), which wasn’t due to be completed until June of this year, is done. And now, the BC Transmission Corporation is looking to upgrade the central Vancouver area in general. Does this affect you? Let me answer your question with a question; are you on the following map? The blue lines represent the proposed route of new underground tranmission lines, leading to a new substation at Alberta and 6th. That’s not a bad area for a substation, being mostly offices and light industrial, but one look at the map shows a lot more dug up roads in the future. Maybe I’m just a giant newspaper nerd, but I can’t help but think that the new distribution boxes that have been put out around some of Vancouver’s busiest streets are a great idea. So call me a distribution dork if you will but having one central box instead of a collection of run down boxes is a nice change. 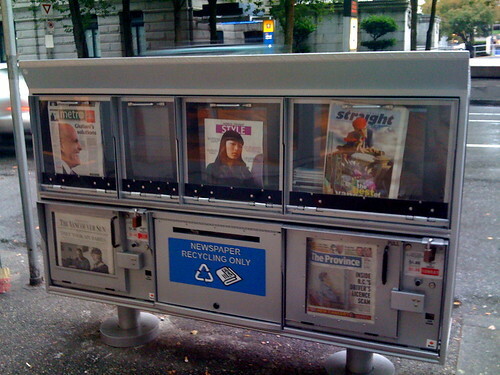 The boxes have space for the free newspapers such as the free dailies like 24Hours and Metro which essentially just run wire service copy, The Georgia Straight and others with two pay slots for The Province and The Vancouver Sun. The fact that there’s a space to put newspapers in for recycling is a great thing as well. Ideally the project could be used as a reason to get rid of the free dailies street hawkers who stand around busy sidewalks blocking people’s way and trying to shove terribly typed tripe into people’s hands. Ideally. Vancity Buzz (which looks less like vomit than it used to) had a post on the new boxes earlier this month [vcb]. The city apparently plans to deploy about fifty of the boxes around town, which is good news if it manages to cut down on litter and the wasted space of four or five newspaper boxes vying for attention on each and every corner. Talk about bizarre crimes and assaults in the news lately! Imagine any ordinary night out on the town, you’re enjoying a nice dinner at a restaurant when boink! You’re hit over the head with a hammer and left unconscious. That’s apparently what happened last night when a man with a history of mental illness went on a little hammering rampage. He injured 9 people with his hammering and luckily has been arrested by police. Anyone else think the news is just getting stranger and stranger? After my complainy comment in Jeffery’s earlier post that nobody had news on what’s happening downtown, details are starting to come together. But first, some downtown geography secrets – if you’re familiar with Richards and Pender, you know the park across from the Holy Rosary Cathedral? OK, how about, one block East of The Railway Club? Weird park, with concrete structures with locked doors? Right, well, that a substation in Vancouver’s downtown power system. Rumour, and possibly hyperbole, has it that the structure is 8 stories deep. And, according to the news, one of the power transformers contained therein went blooey. That’s science talk for “kerpow.” This in turn saw smoke escape up through manholes, vents, and envelope a couple of nearby buildings – which, considering the toxic nature of transformers, seems like a design flaw. The BC Hydro website is saying the outage is due to a switch that failed at 9AM this morning. Which seems a little underwhelming an answer, given the, you know, smoke. For a look at the area affected, check out BC Hydro’s outage map. As, as you’d imagine, they’re not something you can replace with a wrench – as such, it appears downtown may be without power tomorrow as well. No word yet on if this affects the SeaBus service (which is right on the edge of the outage) or the SkyTrain (which runs underneath the affect area.) If anybody can confirm that they’re fine or not, maybe comment on the matter. – Apparently SeaBus and Skytrain are running. The West Coast Express is operating too. – Officials are asking motorists to stay out of downtown. With so many lights out, it’s just causing havok – no need to get in the middle of it.